Nottingham Forest manager Dougie Freedman insists he is under no pressure to sell players and that bids for Michail Antonio and Henri Lansbury are not even worth considering. Burnley made an offer for 24-year-old midfielder and captain Lansbury. 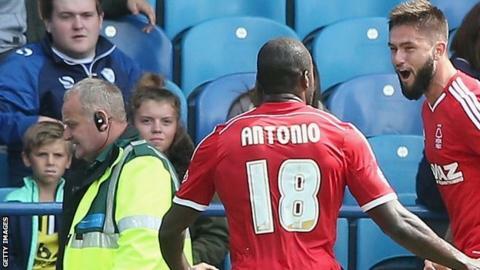 And Premier League side West Brom bid for Antonio, 25, who Freedman described as the best player in the Championship. But Freedman told BBC Radio Nottingham: "Because we are in an embargo it does not mean we need to sell our players." Lansbury rediscovered some of his best form playing for Freedman when the Scot was appointed as manager in February. And Antonio was the club's player of the season last term, starting all 46 league games and scoring 14 Championship goals. Freedman said: "Burnley talk a very good game and try to throw their weight around. But Henri is my captain; he is a great guy to work with and has fantastic quality. That bid is not even worth a comment. "The situation with Michail is simple. We had a bid that I did not respond to. He is the best player in the Championship and you don't want to be selling the best player in the Championship." The Reds have been subject to a transfer embargo since last December, but have managed to cut their wage bill and Freedman is confident they will meet Financial Fair Play requirements by this time next year. Freedman added: "As far as I am concerned the chairman has got a few quid. He is a good man he has been fantastic with me and he has told me, 'you pick the team and decide who goes and comes'. "The bids have come, but we don't need the money."